Plant Description: The Yellow Gentian is a native of the Alpine and sub-alpine pastures of central and southern Europe, frequent in the mountains of Spain and Portugal. It also grows in meadows in Europe and Turkey and is cultivated in North America. All the known species of Gentian are remarkable for the intensely bitter properties residing in the root and every part of the herbage. 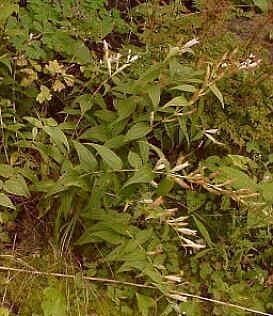 The root is long and thick, generally about one foot long and an inch in diameter, but can grow as large as 3 feet or more long and 2 inches in diameter. The root is yellowish-brown and has a very bitter taste. The stem grows 3-4 feet high, and has pairs of leaves opposite at each joint. The lowest leaves have short foot-stalks, but the upper ones are stalkless. They are yellowish-green, oblong in shape, pointed, and somewhat stiff with five prominent veins on the underside. The flowers are large, orange-yellow clusters with wheel-shaped corollas, usually 5-cleft. They often have tiny brown spots on them which make them look almost red. Medicinal Properties & Uses: Gentian contains some of the most bitter substances known, particularly the glycosides gentiopicrin and amarogentin. The taste of these can be detected even when diluted 50,000 times. Gentian is one of the most useful bitter vegetable tonics. It is especially useful in treating exhaustion and general debilitation from chronic diseases. It is also helpful in treating weakness of the digestive organs and in stimulating the appetite. Besides stimulating secretion of saliva in the mouth and hydrochloric acid in the stomach, gentiopicrin may protect the liver. Gentian is known to purify the blood and is an excellent aid in treating problems of the liver and spleen, dysentery, and jaundice. In addition, Gentian is also used to treat gastritis, indigestion, heartburn, and stomach aches. It increases circulation and is beneficial to the female organs. Other uses for Gentian include fevers, colds, dyspepsia, convulsions, and gout. Dosage: 5-20 drops in water or juice, 2-3 times daily, or as needed. If upset stomach occurs, take with meals. Shake well before using. Disclaimer (U.S. Only): These statements have not been evaluated by the FDA. These products are not intended to diagnose, cure, treat, or prevent any disease. To US Viewers: This website or these products are not intended to diagnose or prescribe for medical, chiropractic or psychological conditions nor to claim to prevent, treat, mitigate or cure such conditions, nor to recommend specific information, products or services as treatment of disease or to provide diagnosis, care, treatment or rehabilitation of individuals, or apply medical, mental health or human development principles, to provide diagnosing, treating, operating or prescribing for any human disease, pain, injury, deformity or physical condition.